What Does it Mean to Be Grateful? Have you ever seen someone who’s grateful all the time and wondered how in the world they do it? They just seem so joyful all the time, and it doesn’t quite seem real or attainable for you. But that’s not true! Gratitude is achievable for each of us, no matter where we’re at in life or what our natural bent is. Gratitude doesn’t have to be such a mystery! Let’s unpack it a bit. Gratitude is simply giving thanks for things. It doesn’t have to be complicated or mysterious. What do you give thanks for? In short, anything you want! You can give thanks for your home, your food, your education, your experiences, your friends, your family, your job, a good book, your dog, your favorite sweater, a lack of traffic, a sunny day, good music, your favorite tea or coffee, or funny YouTube videos. Gratitude isn’t something reserved for just Thanksgiving, though the holiday does present a great opportunity to focus on gratitude and make sure we don’t forget about it! What if we instead chose to approach each day with gratitude, deliberately deciding to infuse each and every day with a focus on our blessings? How might our lives be changed and transformed by such a simple shift in our perspective? By adopting an attitude of gratitude, we reframe our experiences and circumstances. Instead of focusing on the tough things all the time, we see the goodness in the small details and the larger picture. We begin to notice the sunshine, the green traffic lights, the person holding the door open for us, and our favorite song playing on the radio. In noticing these small things, we not only begin to pay more attention to the world around us and its details, but we also have our eyes opened to the fact that there are hundreds of things going on in the world that make it bigger and better than we’d ever imagined when we were laser-focused on ourselves and our to-do lists. In short, adopting an attitude of gratitude opens our eyes and our hearts. It gives us renewed focus. To put this attitude of gratitude into practice, start writing down what you’re thankful for! Once you start, it will be hard to stop, but there are worse problems to have! Here’s an example of the gratitude journal I’ve kept this year (for 2019, I’m looking to keep track weekly instead of just yearly). So what will you put on your list of things you’re grateful for? 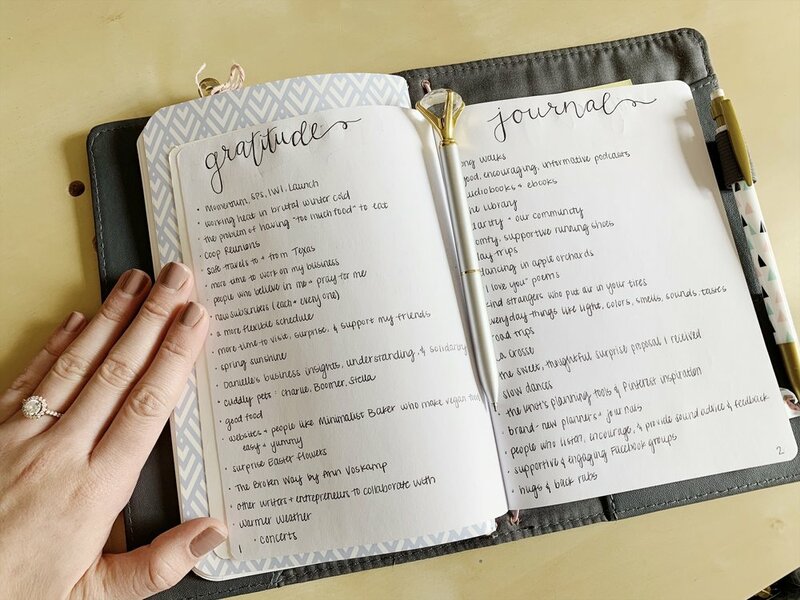 If you’re stumped or just want a little help to get started, you can grab your free copy of my 7-Day Gratitude Journal! Experience more joy and fullness in your life by keeping track of what you're grateful for with this free 7-day gratitude journal! Complete with daily prompts, it will help you start a solid habit of paying attention to what you're grateful for each day! The information you provide on this form will only be used to provide you with simplicity tips. Your privacy is important to us! Please confirm your consent to receive tips via email.